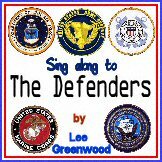 Army Theme Songs Sing-along Wave Files by Brownielocks. This is a marching instrumental Wave file. Loading may be slower on some systems. The music plays 5 times cover cover all the verses below. while those caissons go rolling along. Call off your numbers loud and strong. know that those caissons go rolling along. keep those caissons go rolling along. on a caisson that's rolling along. CLICK HERE TO HEAR WAVE FILE OF VOICES SINGING FIRST VERSE of "The Caissons Go Rolling Along." Army Jeep and cheering soldiers animations were public domain.